This unique exhibition is based on the soon to be published book of Lambertville resident Sandy Hanna. ‘The Ignorance of Bliss: An American Kid in Saigon’ displays twenty paintings depicting her life in Saigon as a ten-year-old military dependent from 1960 to 1962. It is of a time when she and her family found themselves in an exotic land living a life of French decadence prior to the horrific experiences that would unfold for both the American and Vietnamese people. This 'Paris of the Orient', Saigon, so aptly named by the French, was a magical place in those early years, especially for the first-born daughter of an American military officer, the Colonel, and her siblings. In 1960, Sandy had never heard of Vietnam: neither had most people in the United States. No one was paying attention to what was happening in this small country halfway around the world. The 1950s had left America under the shadow of a Red Scare with many believing Communism would take over the world. The Domino Theory was solidly in place. The party line was that if Vietnam fell, so would all Southeast Asia, one country after the other. No one seemed to have any grasp of the history or culture of this ancient country. Anyone in the United States government who had any previous knowledge of Asia was thought to be a communist and removed. President Eisenhower, still submerged in the legacy of the Cold War, couldn’t see beyond that. The military advisors who were sent to Vietnam in 1960 would find themselves steeped in the same mire. In Saigon, the Colonel, Sandy’s father, was part of the Military Advisory Aid Group (MAAG) serving in an advisory role as Chief of Ordnance to South Vietnamese military in the Ngô Đình Diệm regime. Sandy's life revolved around servants, learning French, afternoons at the Cercle Sportif swim club, movies at the underground theater, running a black-market business with her thirteen-year-old brother selling baby powder and Hershey bars, as well as, spying on her father and his late-night visitor, Colonel Lee Van Sam. This event is a coming of age story with a historical base that draws the reader into the life of a BRAT (British Regiment Attached Transfer) living in a country with a people so little understood. The political regime of Diem had come into power with the support of the United States after violating the Geneva Accord. This was a treaty agreed upon by the Allies of World War II when the French could no longer hold onto the country. The Colonel’s Vietnamese counterpart, Colonel Lee Van Sam, would give him an expose on the Diem regime after his wife had witnessed her cousin, Madame Nhu, Diem's sister-in-law, entering General Don's boudoir in Dalat. Fearing retribution from this vengeful woman, Sam asked the Colonel to hold onto the documents in case something happened to himself or his family. This expose proved the anti-American sentiment that ruled the American supported Diem regime. He would be imprisoned, released with the help of the Colonel, and eventually removed from the military without pay. Sandy would be privy to these meetings from her stairway lookout as self-appointed spy. Sandy had already established herself as a self-proclaimed spy of her father’s activities since she was eight years old. In Saigon she is pulled into the intrigue that ran under the surface of the decadent French life she was living. This, in combination of the unsupervised life she led, creates a turbulent unpredictable world for the child. 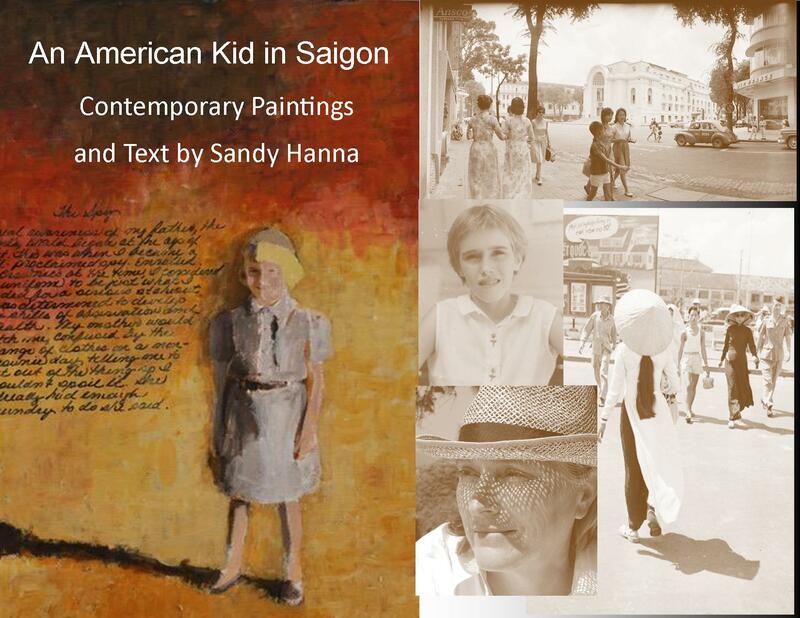 Sandy’s paintings and talk are intended to bring you along with her through this time in a place called Saigon, Vietnam.